A stylishly designed Holy Spirit Dove ring for women, crafted in 10k solid yellow gold, with paisley "s" designs cut-out of the band. The Christian dove ring weighs approx. 3.91 grams and is available in women's 4 - 9, including half sizes. "Likewise the Spirit also helpeth our infirmities: for we know not what we should pray for as we ought: but the Spirit itself maketh intercession for us with groanings which cannot be uttered" (Romans 8:26). 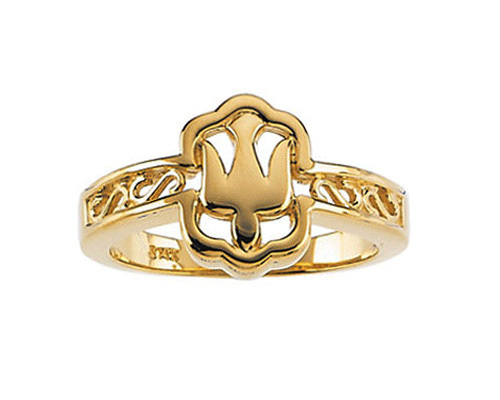 We guarantee our Holy Spirit Dove Ring for Women, 10K Gold to be high quality, authentic jewelry, as described above.